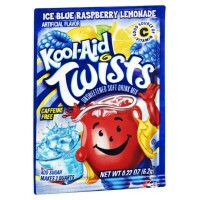 Oh yeah, Kool-Aid makes the best fruity drinks around! Now you can get this famous U.S. soft drink with a delicious sweet n' sour twist that will make your tongue turn blue! Blue Raspberry is a popular American fruit flavor, and you'll love this blend with the tasty tartness of lemonade. Just add sugar and water, stir, and serve. Kool-Aid will always help you get the party started! Acidity regulators E330-E341-E331, maltodextrin, modified corn starch, less than 2% of: antioxidants E320-E300 (vitamin C), natural and artificial flavors, color E133. Contains GMO. Nutrition facts (for 100g): calories 0Kcal, total fat 0g (saturated fat 0g), total carbohydrate 0g (sugar 0g), protein 0g, salt 1.6g.